Trade shows and conventions are among the most exciting venues to market your business. What’s better than a packed exhibit hall bustling with industry professionals and target consumers? Although they’re advantageous, trade shows can be a major logistical challenge. And because there are hundreds of vendors clamoring for attention, it’s often difficult for one company to elevate itself over the rest. That’s where GoGather comes in! We’ll help your company not only survive the hustle-and-bustle of a trade show, but thrive in it. Our convention and trade show services will help your company make a big impact at any exhibition. We’ll evaluate your company and help you select the best trade shows to attend. We’ll help you develop objectives, and we’ll plan trade show marketing strategies to help you accomplish those objectives. A trade show can give your business a massive boost in marketing and networking. But your company’s daily operations shouldn’t be hampered by trade show planning. Let us take the stress off your shoulders so you can stay focused on running a successful business. When it’s time to exhibit, you’ll have all hands on deck. GoGather will train exhibit staff, assist in the installation and removal of exhibit materials, and lead retrieval support. There’s no easier way to participate in a convention. We’ll do the preparation and heavy lifting so that you’ll have more energy to engage with attendees. We’ll use all this information to help you plan your marketing strategy for the next expo! When improperly managed, trade shows can be a stressful endeavor that could even result in loss of profit. But successful trade shows can leave the whole industry—and scores of future clients—buzzing about your business. GoGather is the perfect partner to help you reach your expo goals. We’ll remove all of your preparatory and logistical stresses so that you can focus solely on showing the world what your company does best. 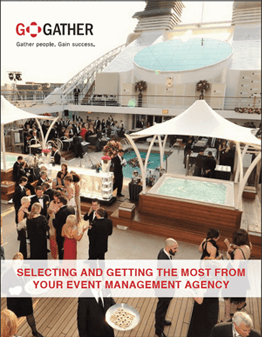 We partner with GoGather to execute more than 30 trade shows and events each year. Their vast experience managing event processes and logistics gives us confidence that each event is in expert hands. They take care of the details so we can focus on our business goals. They also help us stay focused on cost management by negotiating supplier contracts, making sure we meet deadlines to get extra discounts and offering creative event solutions within our budget. GoGather’s kiosk setup is much more inviting and encourages greater interaction between the exhibitor and guest. The whole expo looks much more polished and professional because of the clean lines and uniformity.